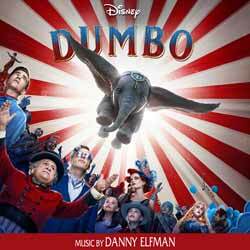 Danny Elfman's score for Dumbo is a crowd pleaser if you're an old school Elfman fan. While this album's 29 tracks (1 hr, 54 sec) is packed to bursting with new and interesting themes, every now and then you'll hear a beat from Edward Scissorhands; a few notes from Batman; and the spirit of Beetlejuice. This is classic Elfman at his finest. For those that loved the 1941 original Dumbo, you'll be glad to hear that they've brought back the song 'Baby Mine'. Here it's performed by Sharon Rooney, who plays Miss Atlantis, and Grammy-winning group Arcade Fire performs an acoustic rendition in the end-credits. There's touching themes housed in tracks like 'Meet the Family'; 'Dumbo's Theme'; 'Goodbye Mrs Dumbo'; and 'Colettes Theme'. Fun, upbeat pieces, like 'Trains A Coming'; and 'Clowns 1'. And epic action adventure themes in tracks including 'Stampede'; 'Colosseum'; 'Holt In Action'; and 'SoaringSuite'. The strangest track, which is also one of the album's highlights, is 'Pink Elephants on Parade'. It has a freaky mix of Edward Scissorhands, Beetlejuice and Mars Attacks. Fans of the movie will relish the opportunity to own this musical souvenir and Elfman collector's will be proud to add this to their music library.